Sebastian Junger has made a career of documenting why some people embrace danger as a way of life. His debut book, The Perfect Storm, chronicles the deaths of a crew of Gloucester, Mass. fishermen during the Halloween Nor'easter of 1991, and his last documentary, Which Way Is the Frontline from Here, recalled the life his late friend and collaborator photojournalist Tim Hetherington who died in 2011 covering the fall of the Muamer al-Gaddafi regime in Libya. In addition to the film, Junger founded Reporters Instructed in Saving Colleagues (RISC) Training, which teaches war correspondents first aid skills necessary to survive covering a fire fight. One hundred forty-four people have been now been trained to deal with injuries like the one that killed Hetherington. 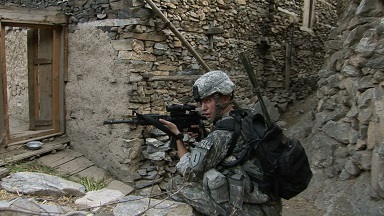 Junger and Hetherington had previously collaborated on the 2010 documentary Restrepo, which followed a group of soldiers throughout their 15-month deployment in the Korengal valley of Afghanistan from 2007 to 2008. The two contributing editors for Vanity Fair earned Oscar nominations for the film. Hetherington also collected a book of photos from the deployment called Infidel, while Junger's book War examined the psychology of modern combat. Both men collected enough material to make several films without repeating a single image or sequence. In fact, some of Hetherington's work during that period appeared on CNN and ABC News. Nonetheless, Junger has managed to find intriguing angles on the deployment and on the longest military commitment in U.S. history in Korengal, which opened on Friday. The new film offers some sober reflection to the visceral jolt that came with Restrepo. When contacted by phone for this interview in a New York deli, Junger freely admits that he's never really left Afghanistan or Outpost Restrepo. From watching Korengal, it seems like you're having the soldiers themselves tell the story of their deployment. What Tim and I wanted to do with Restrepo was give audiences the experience of combat or as close as possible, so there's no musical score. There's no narration. There are no interviews with generals. None of those things happen in combat. Korengal is really different. I structured it after my book War, and I really wanted to do an inquiry into what combat looks like and what the consequences are for soldiers. What does the word "courage" mean? How does fear work? Primarily, why do soldiers miss combat? What is it that they miss? This might sound grandiose, but what I conceived of was a film that would help soldiers understand their own experience and by extension help civilians understand what soldiers did on their behalf. How did you and Mr. Levine structure the existing footage this time? Basically, I teamed up with Michael Levine, who was the editor on Restrepo, and he reread my book War, and it was actually Michael who said "Listen, why don't we structure the film along the lines that War is structured, as a tripartite structure, three sections: fear, killing and love -- the three primary emotions of combat as I understood them. So that's how we structured Korengal. We didn't call attention to it, but that's the underlying material we decided on. From watching Korengal, it seems obvious these guys could have difficulty coming down from the adrenaline high that comes from combat. You're in a group that's totally inter-reliant, and the consequences are life and death. You're highly trained and highly focused. It's all the things that young men love, frankly. There's a lot of neurological wiring in young men that do that and gets them to like it. It's one of the reasons that boys are so into video games and girls aren't. The same neurological wiring is responsible for both things. There's a huge amount of adrenaline involved, too. Those two drugs, adrenaline and closeness, and being part of a highly functioning group, they are two drugs they respond to. They come back to this society, which is both very dull and very poorly connected, and they just miss it. When I saw Restrepo in a theater, the audience all gasped when they learned that Outpost Restrepo had been abandoned, but in Korengal, you see why because it was too logistically challenging to keep it resupplied. A lot of things were going on there. First of all, you really can't take the position of wishing we'd get out of Afghanistan and also being upset that they pulled out of Restrepo. There's a thousand Restrepos they're pulling out in order to leave the country. So that's just part of the process of war, is to take over positions because they're important this year, and then the strategy shifts, and you don't need them anymore. It's not that they couldn't hold it. Of course, they could hold it. It's just that after a few years it wasn't serving a useful purpose. I think that's a very hard thing for civilians to understand. Civilians, understandably, look at the war in political terms. They don't really look at it in strategic terms, which is all that the generals are doing. It really is two different ways of looking at the same thing. Absolutely. If the Taliban didn't change strategy during the war, there wouldn't need to be reconfigurations like this. War is an exercise in mobility and agility. If you had to stay at every position you ever occupied, you'd get annihilated. You couldn't move. You would fail very quickly. The logic behind the American positions in the Korengal wasn't that the Korengal itself was important, at all. But it was being used as a base for insurgent attacks on the Pech River valley, which was extremely important and is a huge population center. They were building roads and medical clinics and schools and things like that. The Taliban were attacking from the Korengal, and they were stalling those projects. So the Americans just occupied it until the road was done and the clinics were done, etc. Then they pulled out. It was just a really sensible way to do it. It's just that it was quite costly. Because you're looking at footage that you and Tim Hetherington shot back when Bush was still president, what's it like to see that footage now? On the one hand, it seems like I was just there. That's the funny thing about memory. It seems like I was just there. But another part of me can't believe I was ever there at all. It's so extraordinary, I just watched the footage, and it was like, "Damn, that was me. That was Tim. I can't believe we were out there." So it's a funny double experience. Since Tim died, it was also quite poignant looking at footage that he shot or footage that I shot where he was in the corner of the frame. In the new film, you have more footage explaining why the Korengalis were hesitant to embrace American troops there because they're caught between the Taliban and the troops. Yeah, people in high crime areas are slow to embrace the police because they don't want to have repercussions. Day after day, they have to live there. It's a very classic police problem as well. How will the current Afghani elections and the projected 2016 draw down of American troops affect the situation in Korengal? It's a complete backwater. I don't think it will be affected at all. The Taliban never went in there when they ran Afghanistan. The Afghan government doesn't really go in there. There's 5,000 people who live in that valley. They don't matter at all in the larger picture. It doesn't matter to Korengal. If you broaden the question to Afghanistan, I think the President (Obama) had a tough choice. If you leave 100,000 troops in Afghanistan, the Taliban will definitely not take over, but there's a real downside politically at home for the President. And in Afghanistan, they don't want us there any longer than necessary. What country would? If you withdrawal all the troops you run the risk of the whole house of cards collapse and have the Taliban take over again, which is obviously a terrible for Afghanistan and probably for this country as well. So, by having 9,800 troops who are not on combat patrols, that are not on combat operations, that's a pretty good compromise. The elections, I think, were a big success. Sixty percent of the population voted, way higher than anything I've ever seen in this country. The front runner by a large margin (in the upcoming runoff) is Dr. (Abdullah) Abdullah, whom I spent two months with in 2000. He's a very dignified, educated and principled man. He's vowed a really fight against corruption, which is probably more important than fighting the Taliban. I think the country has a real chance of rehabilitating itself now. That said, Dr. Abdullah is still going to have a serious mess to clean up after what has happened with Hamid Karzai's regime. Yeah, but it's the first freely-elected Afghan government. The Taliban have a huge PR problem in attacking it. They say they're attacking the infidels and their puppet regime, but it's a different thing when 60 percent of the country chose Dr. Abdullah, or however it turns out. That's a PR mess for the Taliban. Of course, he'll have a mess to clean up. Obama had a mess to clean up when Bush left. That's just what being the leader of a country is. But the (Afghanis) are a strong, hard-working and resourceful people and very independent and proud. He can do it. He's half Pashtun, half Tajik. He's respected by just about everybody, even by people who don't want him as president. I think if anyone can do it, he can. The Taliban tried to stop the election with attacks, and they were almost completely blocked from doing that. It was as good as it could have been. All photos from Korengal, © 2014 Saboteur Media. Used by permission. 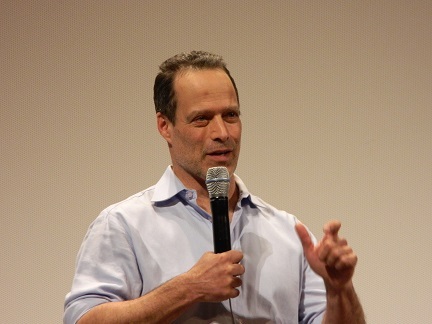 Photo of Sebastian Junger by Lybarger.